All-day comfort and multiple ergonomic carry positions to keep baby close while enjoying everyday adventures. The award-winning baby carrier that made our name. 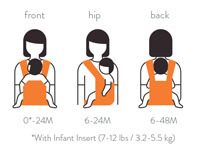 Fabric: The Ergobaby Original Carriers are made from 100% Cotton fabric while the Performance Carriers feature a lightweight breathable mesh back panel to keep baby cool and is ideal for warmer climates.